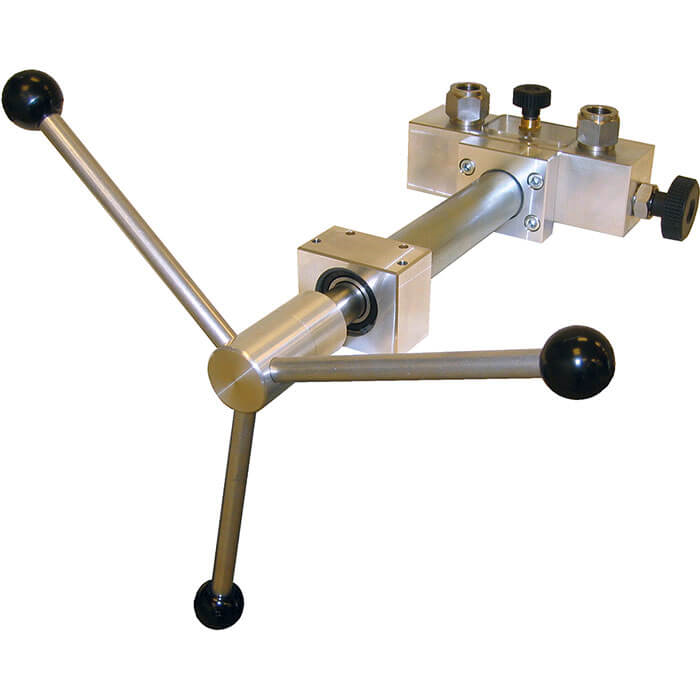 Hand spindle pumps serve as pressure generators for the testing, adjustment and calibration of mechanical and electronic pressure measuring instruments through comparative measurements. These pressure tests may be carried out in the laboratory, workshop, or on site at the measuring point. The hand spindle pumps models CPP1000-M and CPP1000-L have been designed primarily for the testing and calibration of pressure measuring instruments with small volumes. Test items and reference instruments with larger volumes should either be pre-filled outside the test pump or also simply and conveniently filled directly from the hand spindle pump, using the shut-off valves available as an accessory for the test connections. The CPP1000-L is the case version with a narrow rear flange, sealed reservoir and a fine adjustment valve built-in as standard. For the CPP1000-M, the fine adjustment valve is available as an accessory and can be fitted as an option. The test connections are G ½ female. Corresponding thread adapters are available for the calibration of instruments with different connection threads.